I guess by now you know my name is Chrissy. I was named for the blonde in Three's Company, you know, the old TV show. I am adopted. I came to my family when I was only about six months old, but it was a long six months of waiting. I don't know where I was born or who was responsible for me; all I know is that my friend Missy and I found ourselves in the Killeen, Texas Animal Shelter. We were scheduled to die there because whoever had us before took us there and left us. A lady named Nancy and her husband, Paul, saw us there and saved us the day we were to be killed. They were animal rescuers. How could we have been so lucky? We were very afraid and we were not very healthy either. I had a broken tail and I think maybe a broken foot and neither had healed very well. Missy and I clung together and the lady took us home. The next day we were given to an animal rescue group for little dogs and they went about finding us each a home. Missy and I depended on each other and we were both fearful of making new friends. We even acted kind of strange and the people at the animal rescue group were afraid that it would be hard to find good homes for us since we seemed to be different from "normal dogs". Missy was adopted first but only by a day or two. She found some loving parents and is happy. My mom found me while searching the internet for a little Maltese dog to love. My picture was on the animal rescue site and I didn't look pretty at all. In fact when my mom showed someone else my picture, they didn't think that adopting me was a good idea because I looked so pathetic. I sure wasn't a full bred Maltese but I had a certain look that my mom says she fell in love with the minute she saw my picture. It was the middle of the night when she saw it and emailed the rescue people right away. Lucky for her. she thought, because one of the wonderful ladies, April, was still awake and sent her an application packet within minutes. She filled it out and mailed it right back and two days later I had a new home. I was very scared. I missed Missy and the only person that I knew who was safe was the lady that was caring for me. When she left me at my new mom's house, I was so sad, confused and scared. I had been in so many places within just a few days. But, my new mom took me shopping right away and we bought a lot of fun things to eat and play with as well as a brand new bed just for me. I didn't know what to do with the toys. What I did like was sheets of paper. I carried them around in my mouth until I found a safe place to store them. I also gathered other things for storage too, like my mom's credit cards out of her purse (I chewed them up a little - she said she was probably using them too often anyway, so she wasn't mad at me) and small things that I would find around the house. I kept them in my storage spot in a nice neat corner of the couch. I did lots of weird things like that but my mom said it was okay. She said when I felt more secure that I would probably stop doing weird things and she was right. I know now that my mom loves me very much and loves me no matter what I do so I am finally a happy little dog. I have been in my new home for three whole years on July 4th 2004. My mom and I travel a lot and my big human sister is a soccer player at a college in Arkansas (we live in Texas). So I get to visit college a lot and go to watch all the soccer games there and in other states too. I have two human brothers too. They are firefighters and my mom and I are very proud of them. I love it when they visit me and get really excited when mom tells me they are coming to our house! I have some dog and cat siblings too. I like some of them but sometimes I am not very nice to all of them. Mom doesn't like it when I'm not, but I never hurt them or anything..geesh. Sometimes they just take up too much of the attention around here. That's my story and my mom is grateful to Nance and Paul Talbett and to Wee Rescue for saving my life. She has been much more involved with animal rescue ever since finding me. Wee Rescue has lots of pups like me if you are interested in sharing your life with a fluffy little friend. Please visit their website. If you would like a bigger dog than me, then please visit the other rescue groups that are listed in the links section of this site for more information. We come in all breeds and sizes! Rescue dogs never forget where they have been and how you have made life better for them. My mom says there is nothing more rewarding than watching an animal blossom from being loved. Chrissy came to be loved by us on her first day in her forever home on July 4, 2001. 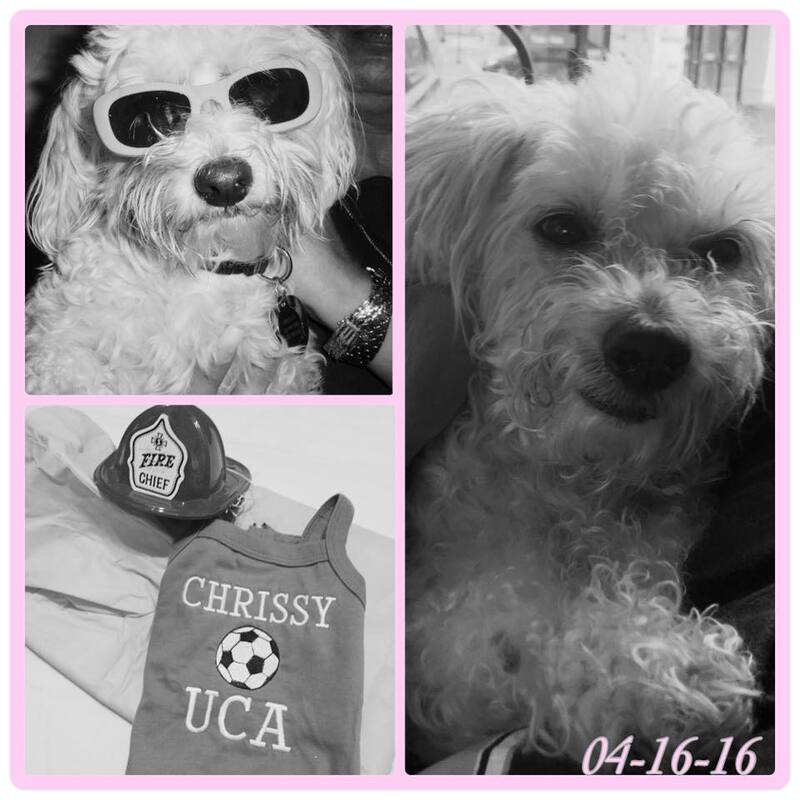 My precious Chrissy passed away on Saturday April 16, 2016. She was 15 years, 2 months old. Forever in my heart and soul. "And can it be that in a world so full and busy, the loss of one creature makes a void so wide and deep that nothing but the width and depth of eternity can fill it up?"